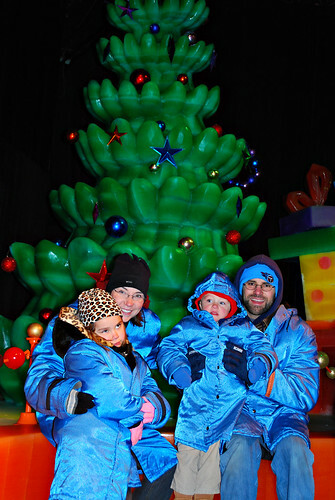 On Saturday we took the kids to see the How the Grinch Stole Christmas Ice exhibit at Opryland Hotel. This exhibit is really awesome and the kids had a blast. I will have a more detailed post later in the week when I have a chance to go through the photos. For now I will leave you with my Best Shot. Well, I can't take credit for the photo (Thanks Gina), but I couldn't resist making this my Best Shot. I laugh every time I look at this photo. Do you see that expression on Harper's face? It is very representative of her attitude lately. Just in case you didn't get the full effect with the shot above, here's another one. Well, at least I have a photo of the four of us together, right? regardless of her expression, it's always nice to have a shot with all of you in it! her look is priceless :). ha ha ha they don't look amused, at all! Great shots, though. Priceless and someday they will look at them and laugh! That is funny! I have some of those shots myself. 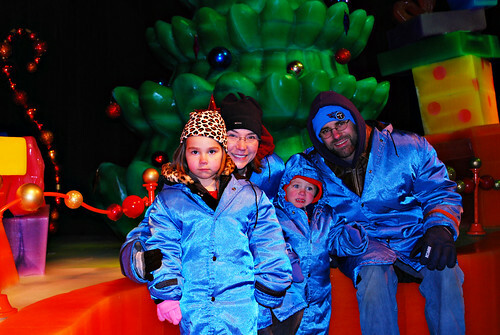 Love those blue matching coats! I love your little girl's face in the first picture - priceless! It's like, "Are we done yet?" Attitude! I am totally feeling you on that one these days. Everyone's right though, a picture with the whole family is wonderful to have regardless! I love the beautiful blue coats you are all wearing! Those are some electric blue coats! Sounds like such a fun place. Just to clarify. Those are not our coats. They handed them out so we would not freeze. hehehe, so funny. I think I can relate to that attitude. but hey, at least you've got some family pictures! And, how cute that you guys are all matching! Oh we have the attitude here as well, it must be the over stimulation from the holidays. I love how you and your husband are smiling! Love the beer cozies, too cute! Would any other kind of family shot really capture the true way of things?! Too cute.